A Midland facility has recently become recognized by the U.S. Green Building Council’s (USGBC) Leadership in Energy and Environmental Design (LEED) program as the third only Silver Certified facility in the Great Lakes Bay Region. This certification is used to represent a facility that has utilized “best-in-class” methods and practices to create a more sustainable and environmentally friendly facility, both during construction and in operation. The facility, located on Contractor Drive in Midland and completed in 2013, was designed and built by Three Rivers Corporation for Fisher Contracting. 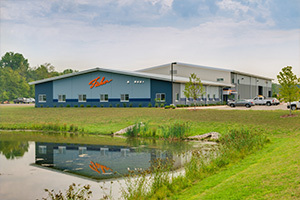 Three Rivers worked closely with Fisher throughout design and construction in order to improve the finished building for end use in the fields of sustainability and energy efficiency. 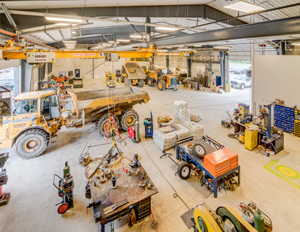 The facility contains many exceptional features that save energy and resources. Chief among them is a system for producing energy from waste oil. After oil is used by machinery, it is combusted in a small boiler rather than transported off-site for disposal. This process produces enough energy annually to heat the facility for nearly a full winter. Another notable energy-saving feature is a geoexchange system. This system heats and cools the building using water that is tempered by the earth’s natural ambient temperature. The facility also minimized their water use by 32% through the use of “low-flow” fixtures and other means. In addition, the 50-acre site development was built using all recycled gravel, crushed concrete, milled asphalt and storm sewer pipe, structures and castings. 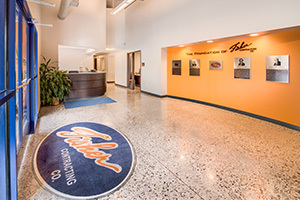 The LEED Silver certification caps a cooperative effort on the facility which is rooted in a rich history between Fisher Contracting and Three Rivers Corporation. The two organizations have worked together on projects dating back to the 1970s. Sherman also noted that the project prioritized the use of local businesses to complete construction, and that Three Rivers was honored to be a part of the community-based, team effort. In addition, about one-third of the materials used in construction were acquired within the Midwest – materials such as carpeting, concrete and steel were all made within 500 miles, helping to achieve LEED certification. Three Rivers Corporation (www.TRCcompany.com) provides design and construction services to the industrial, commercial and institutional markets, specializing in design/build, mechanical, general contracting and construction management. The Fisher Companies (www.fishercompanies.net) consists of ten separate companies, located in Mt. Pleasant, Midland, and Bay City, Michigan. They are a leading integrated supplier of contracting services, asphalt production and paving, heavy-haul transportation services, ready mixed concrete, sand and gravel, natural aggregates, equipment rentals, engine rebuilding and more.